View looking south from the Goosenecks State Park parking lot. What in the world is a gooseneck? When it comes to describing a landform, fowl play (pun intended) may seem apparent. Even when you are standing in front of one, the answer is not obvious. Not until you get a look from above does this name start to make sense. In geology, “goosenecks” is a term used for sinuous canyons and valleys that resemble the curved neck of a goose. The Goosenecks of the San Juan River have rightfully earned themselves a state park designation. 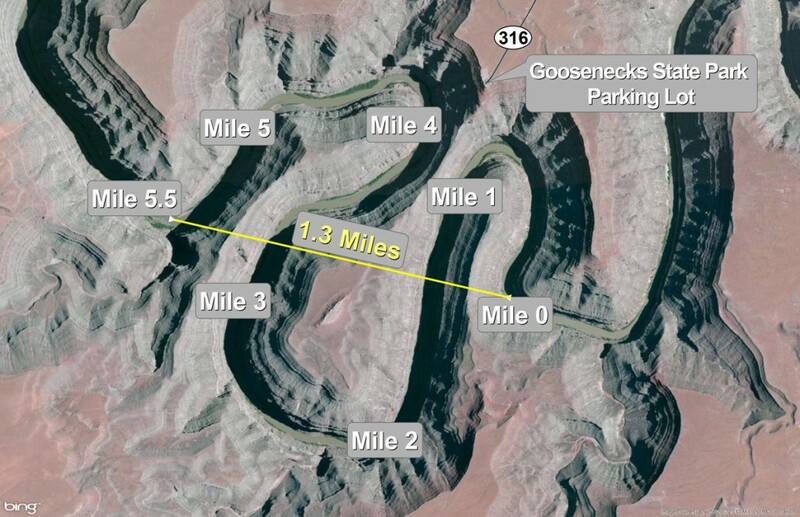 Goosenecks State Park is, in essence, a parking lot perched at the edge of a precarious 1,000-foot cliff. This abrupt cliff, however, provides a panoramic view of the winding canyon holding the San Juan River below. The lower and upper cliffs that line the San Juan River are composed of more than 300-million-year-old rocks known as the Paradox and Honaker Trail Formations, respectively. The Halgaito Formation overlies the Honaker Trail Formation, and blankets the desert landscape along the road to the state park, while also providing a foundation for the parking lot. Limestone, siltstone, sandstone, and shale beds constitute these cliff and slope-forming rocks. These rocks have their origins in an ancient marine environment where sea level alternately rose and fell before eventually receding, leaving behind a largely flat terrain. The ancestral San Juan River meandered across this gentle landscape, literally setting its path in stone. 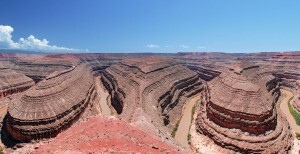 Meandering streams similar to the ancient San Juan River flow throughout the world; however, specific conditions must be met for them to cut such deep, winding canyons called entrenched meanders. This brings up a bit of irony because meandering streams twist and turn as they do because of a low gradient, which in itself is the reason why they also do not typically cut deep canyons. On the other hand, rivers with high gradients flow faster, giving them the erosive power to cut deep canyons; however, high-gradient streams also typically cut straight channels. So, how did the San Juan River cut 1,000 feet into the ground when it had such a low gradient? It was able to do so because long after the San Juan River’s sinuous course was set, its headwaters slowly began to rise along with the rest of the Colorado Plateau (approximately 15 to 20 million years ago, although the timing of this event remains a subject of debate among the geologic community), concurrently increasing the river’s gradient, flow velocity, and downcutting rate. Since the San Juan had already set its path in its earlier stages, this new rapid downcutting overcame the river’s determination to change its course, thus allowing it to continue along this path while slicing deeper and deeper into the canyon’s rocks. The Goosenecks of the San Juan are not alone, as there are other entrenched meanders in the western United States and elsewhere. Capitol Reef National Park’s Sulphur Creek in Wayne County is another textbook example, as well as parts of the Snake River Canyon in southern Idaho. Many others can be found throughout the Colorado Plateau, but none are so tightly wound and deeply incised as the San Juan River’s goosenecks. Goosenecks State Park is located at the southern dead end of Utah State Route 316 approximately 270 miles southeast of Salt Lake City. From Moab, drive south on U.S. Highway 191 for approximately 100 miles to Bluff (where the highway turns into U.S. Highway 163). Continue west on U.S. 163 for 17 miles and turn right on Utah State Route 261, then after one mile turn left on SR 316 and continue about 3.5 miles to the parking lot. The state park is free to visitors, and camping is available without a reservation year-round. Tent camping, however, is for those who are truly adventurous as this area can become extremely windy.